The Astoria Chapter, National Society Daughters of the American Revolution (NSDAR or DAR), was organized in 1920 and chartered in 1921 with twenty-three members. Since that time, the chapter has provided historic markers throughout the community and planted trees including a Minuteman Red Maple sapling at the reconstruction of the 1852 U.S. Customhouse in the down area of Astoria. ​One of the service projects we organize is our annual retiring of worn-out American flags on June 14th, Flag Day, at Fort Stevens Historical State Park. The United States Flag Code states, “The flag, when it is in such condition that it is no longer a fitting emblem of display, should be destroyed in a dignified way, preferably by burning.” The community is invited to attend this ceremony. ​The Astoria Chapter, NSDAR, supplies books, crayons, etc., for the children’s library at both the Columbia Memorial Hospital and Seaside Providence Hospital and provides refreshments for visiting troops at Camp Rilea in Warrenton, Oregon. The City of Astoria, Oregon, holds the distinction of being the first permanent United States settlement on the Pacific coast and for having the first U.S. Post Office west of the Rocky Mountains. It is located at the end of the Lewis and Clark Trail along the south banks of the Columbia River and the north banks of Young’s Bay. Astoria is only a few miles from the Pacific Ocean. The Lewis and Clark Expedition spent the winter of 1805–1806 at Fort Clatsop, a small log structure south and west of modern-day Astoria. Today the fort has been recreated and is now a historical park. If you can trace your lineage to a patriot of the American Revolution, we would be honored to have you become a member of Astoria Chapter, NSDAR. 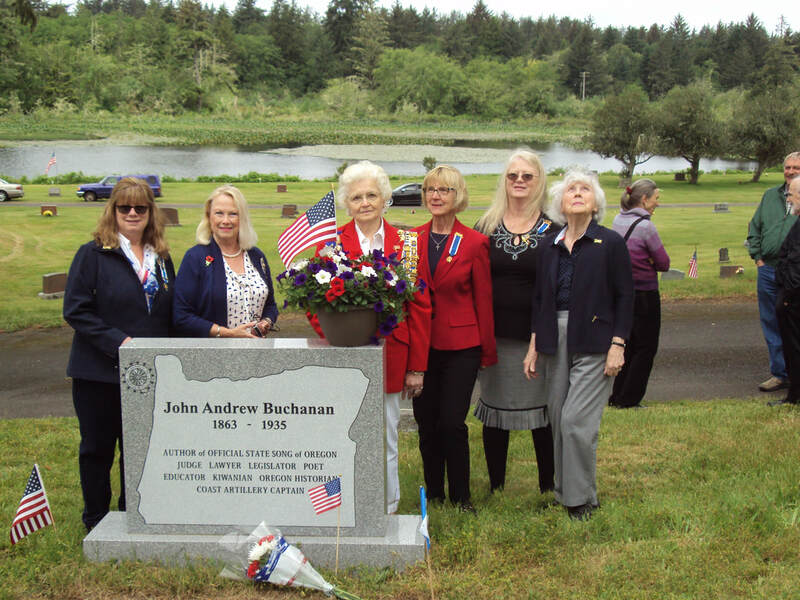 Much more information may be found at either the National Society Daughters of the American Revolution (NSDAR) website or the Oregon State Society DAR (OSSDAR) website. Meetings are on the third Wednesday of the month, 11:00 a.m. September through May. For assistance, please contact our chapter registrar or you can use our membership information form. ​Header Photo Credit: Robert Bradshaw. Wikimedia Commons. The wreck of the Peter Iredale in the Fort Stevens State Park, Oregon, USA, at sunset. Ran aground in 1906. ​For comments or questions about this website, please contact our webmaster with questions.